On your arrival at the Cochin Airport or railway station make yourself comfortable with our relaxing cab services that will drop you at the Hotel. There after check-in, have mouth-watering cuisines of the chef and relax a bit to shed off the fatigue. In the afternoon, you can start your journey of exploration with Bolgatty Palace and Fort Kochi. The time of sunset can be well enjoyed at Sunset Cruise on Arabian waters where you can cover Chinese Fishing Nets, Mattancherry and Willingdon Island. The evening can well be spent at Marine Drive or MG road with some shopping spree. Stay overnight at the hotel. Distance from Cochin to Munnar is around 140km that might require 4 to 5 hours. You can have the breakfast at hotel and then start towards your destination. The road trip from Cochin to Munnar is one of its kind with lush greenery all around. On your way to Munnar you will visit enchanting waterfalls like Vallara Waterfalls, Cheyyara Waterfalls and Attukad Waterfalls. By the late afternoon you will check in to the hotel and have a powerful nap. In the evening you can explore near by places or go for shopping. You will have a pleasant overnight stay at the hotel in Munnar. With two nights at Munnar with our Munnar holiday package, you can explore this small yet exquisite hill station. After break fast you can go to the excursion of various places like Mattupetty Dam, Echo Point, Gundala Lake, Photo Point and Anaimudi Peak. In the evening or after lunch you can go to Eravikulam National Park, Elephant Rides, Aromatic Gardens and Spice Plantation. Enjoy the leisure and over night stay at hotel. After spending time in the blissful nature of Munnar your Kerala Travel Package will take you toward Thekkady which is at the distance of around 95km from Munnar. After reaching to Thekkady we will take you to the Periyar National Park where you can enjoy the thrill of Jungle Safari. In the evening you can have a boat ride at Periyar Lake. After which you can spend the overnight stay at hotel. Have your breakfast at the hotel and pack your bags for Allepey, situated at a distance of 135 km from Thekkady. With 4 to 5 hours of journey to Allepey which is also known as the Venice of the East you will have a check in to the boat house and enjoy the Kerala backwaters tour. You will spend a lavish and refreshing time with the backwater cruise enjoying the enticing beauty of nature. The journey to Kovalam from Allepey is of over 200 km and allows you to have a thrilling road trip of 5 to 6 hours. On your arrival you can explore the nearby places and go to various beaches. Since it will be late evening so your next day will be for the exploration of major beaches. You can have a blissful night stay at hotel with view of fascinating beaches. After having the breakfast, you can head towards the exciting beach life at Kovalam Beach. You can enjoy the sunbaths, massages and lively sea waves. By the late afternoon, we will head towards the Trivandrum which is at the distance of just 40 km from the Beach City. Enjoy the overnight stay at the hotel. Start exploring the city of Trivandrum after having the breakfast at hotel. You can visit places like Napier Museum, Kuthiramalika Palace Museum, Vizhingam Lighthouse and various other places. After that the cab will drop you to the airport or railway station with each and every effort to ensure that you had a pleasant stay with our Kerala holiday tour packages. 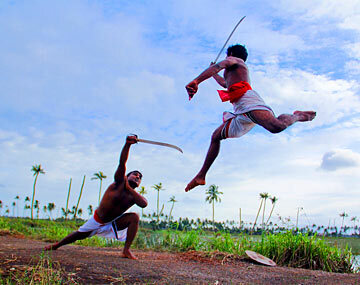 Kerala is an exotic tourist destination to escape from the hectic schedule of day to day life and spend a leisure and relaxing time around the nature. Our Kerala holiday packages will take you to exotic beaches, swaying elephant rides, leisure houseboat cruises, refreshing backwaters and thick forests with coconut trees to calm your quench for travel and nature. Whether you are looking for Kerala Honeymoon holidays or a tour with family and friends we have got covered up you for all. Thank bookotrip for such a lovely vacation. Had a blast with Family! very well arranged package with nice sightseeing, decent accommodation with delicious food.